The rail tour operators behind a train pulled by the legendary Flying Scotsman have announced an amended timetable for those interested in seeing it as it passes through the Sleaford area. Due to having to fit into available slots in between regular services, the timings have been moved later than originally billed. Now, the famous loco will be reaching Lincoln at 11.55am tomorrow (Saturday) as it pulls The Scarborough Flyer on its way to London Kings Cross, in an excursion organised by The Railway Touring Company of Kings Lynn. 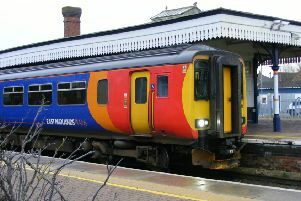 It ill continue on its journey, passing through Metheringham (12.11pm) and Ruskington stations, although not stopping, and take the avoiding line to the east of Sleaford at about 12.24pm before heading south through Helpringham, Donington, Spalding and out of the county, rejoining the East Coast Mainline at Peterborough, on to London arriving at 3.21pm. The train is setting off from Scarborough, picking up passengers at York (where the loco is based in the National Railway Museum), Doncaster (where it was built) and Lincoln on its outward journey. After reaching Peterborough the company said: “The route will be a contrast of fast running and more leisurely rural scenic lines, giving ample opportunity for Flying Scotsman to display its power.